In this post I am going to show how you can extend the class generated by the ORM tools. To demonstrate I am using Linq To Sql ORM. 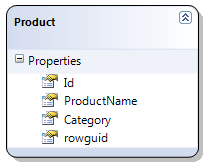 Now I want to display the list of product in my grid but I have to display product name with categoryname for example productname(categoryname) or consider situation where I have ordertable and I have to display one more extra column in grid with display total = quantity * price. To achieve this make look to the class generated by ORM tools, when you see the class definition you see its decorated with the partial keyword. C#2.0 partial class allow us to create class which expands in two different file and at the time of compile both file get compile in one class. So by making use of same rule I have added one more class file and its partial as below. Now to we can consume property in the presentation or businesslayer like as below. So by above way adding property to partial class we can easily achieve the task. By using partial class we can add the custom logic to the class created by the ORM tool(s).